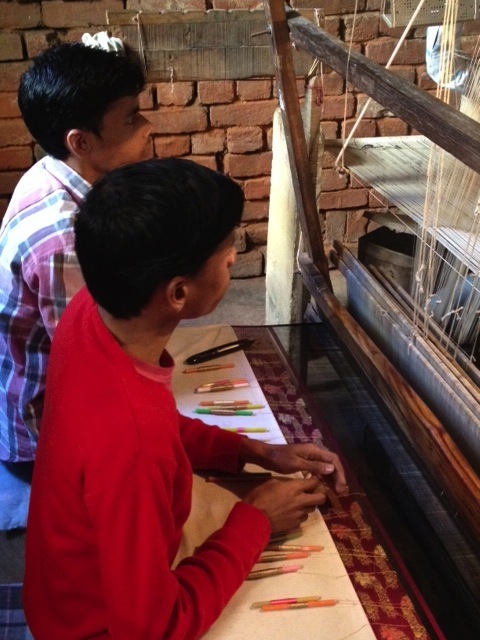 Time to reflect now on the many opportunities we had to see at first hand the story of handloom weaving in India. Our trip took us to weavers working in a room in their village or town; weavers working in sub-standard conditions in small workshops and also weavers working in very good conditions in modern workshops. 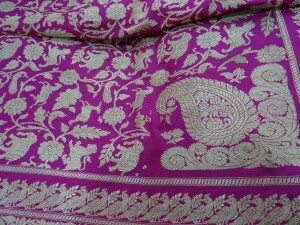 We saw cotton and silk weaving, sometimes with intricate brocades. It is still possible to find many sites where the whole production process, spinning, dyeing and weaving – is done by hand (khadi). Khadi is highly valued but at the same time is fighting for survival as mechanized processes produce greater output and cheaper goods. 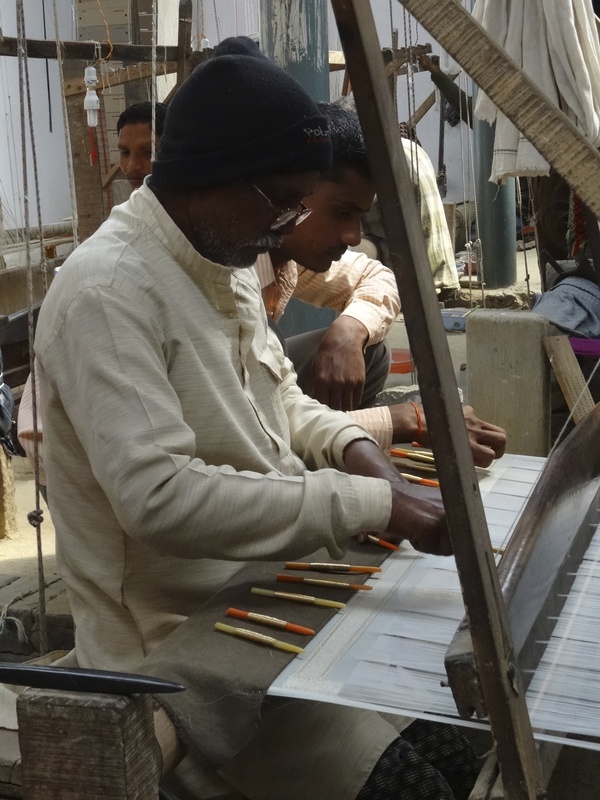 In cities such as Varanasi, once home to hundreds of thousands of hand weavers and home of the famous Benares silk, the tradition is suffering from introduction of the power loom and competition from cheaper textiles from China. 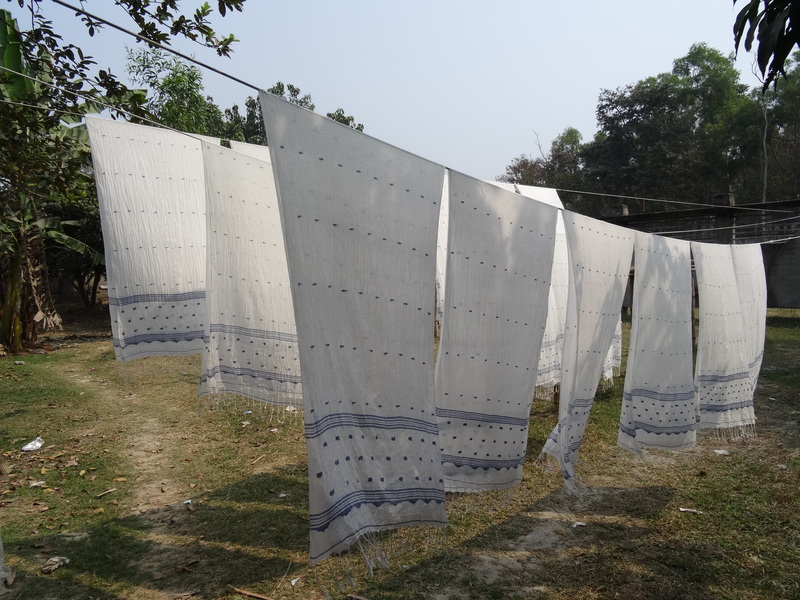 Shantipur in North Bengal is an ancient township with sari hand weaving dating back to the 15th century at least. Weaving flourished here and the town is particularly famous for indigo dyeing. The town is close to the Bangladeshi border and many of the weavers are from there originally. 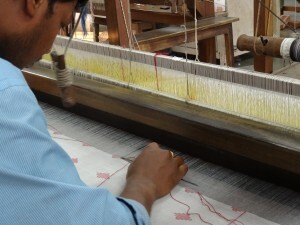 Nearby Fulia/Phulia is another renowned handloom weaving centre, with about forty thousand active looms in the village. Here was our introduction to jamdani, with fine weft inlay patterns woven throughout the body of the fabric, a technique indigenous to India. 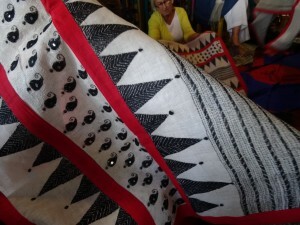 This gives a fabric with many separate repeat motifs, in one contrast colour or several colours. True jamdani is woven with separate bobbins across the warp. In cutwork, the weft threads are carried across the warp and later cut from the reverse so that the motifs are singled out. 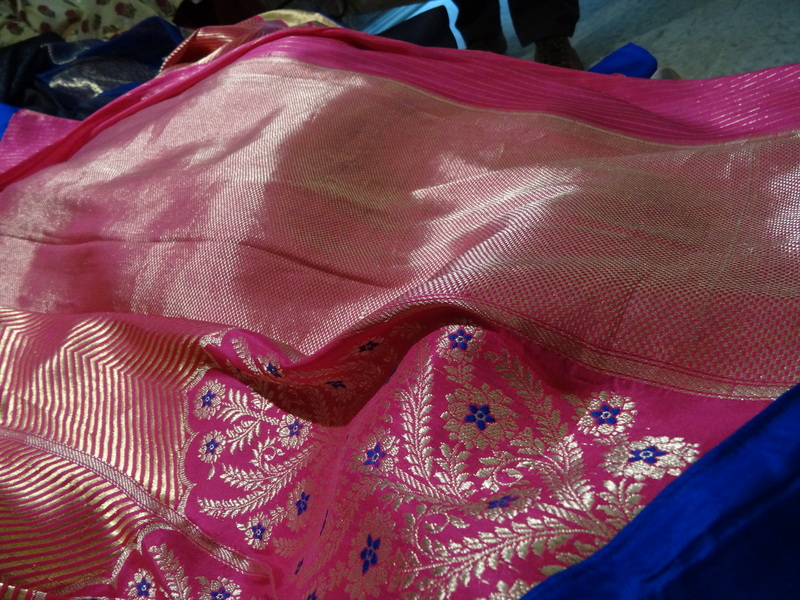 Brocade weaving is extraordinarily complicated and these weavers are master artisans, sometimes following a pattern only by looking at it (that is, without it being coded into the loom mechanism) and then, amazingly, often working on it wrong side up! 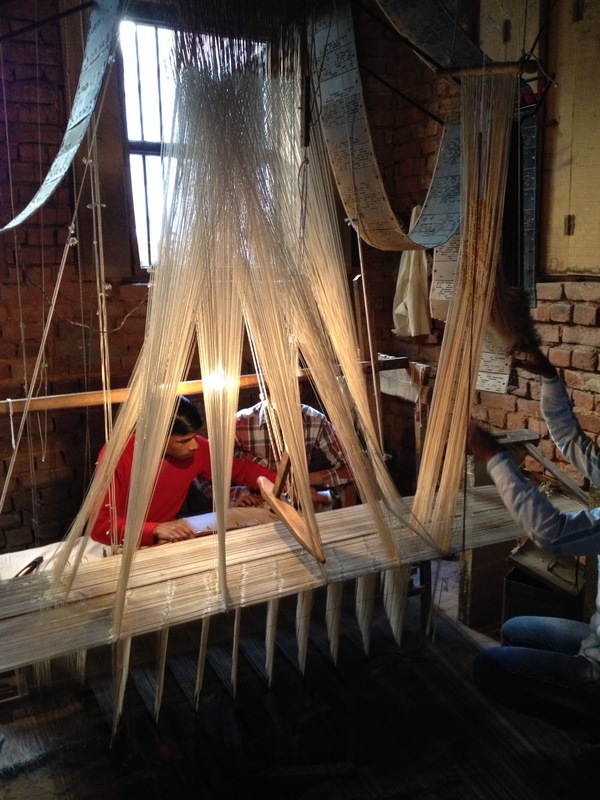 We were privileged to see, both in a workshop in the Muslim quarter of Varanasi and in a textile museum in Delhi, master craftsmen who still weave with a jala loom, used for the famed Benares silk brocades. 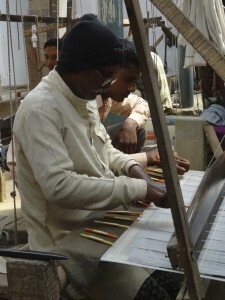 Naseem Ahmad learned from his grandfather, a famed artisan of Benares who revived this ancient and complicated technique. 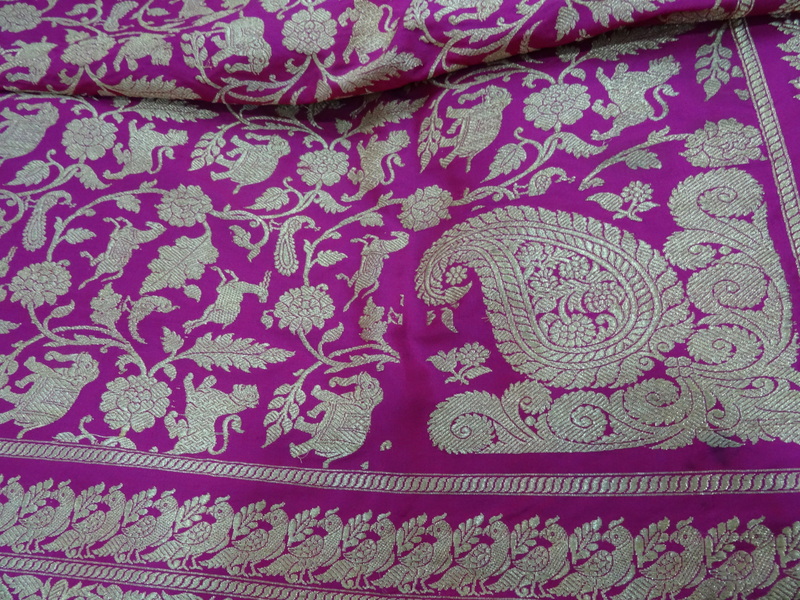 The brocade motif is first created on a table loom and then this becomes a master harness which is attached to the loom and controls the heddles. This replaces the punched cards that control most looms. 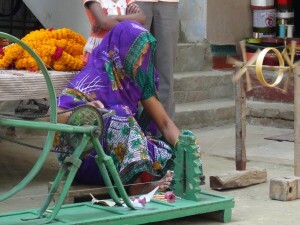 A second weaver or helper sits with this at the back of the loom while the weaver works from the front. This was incredibly complicated and to me it looked like a birds nest, but it obviously made sense to the weavers. 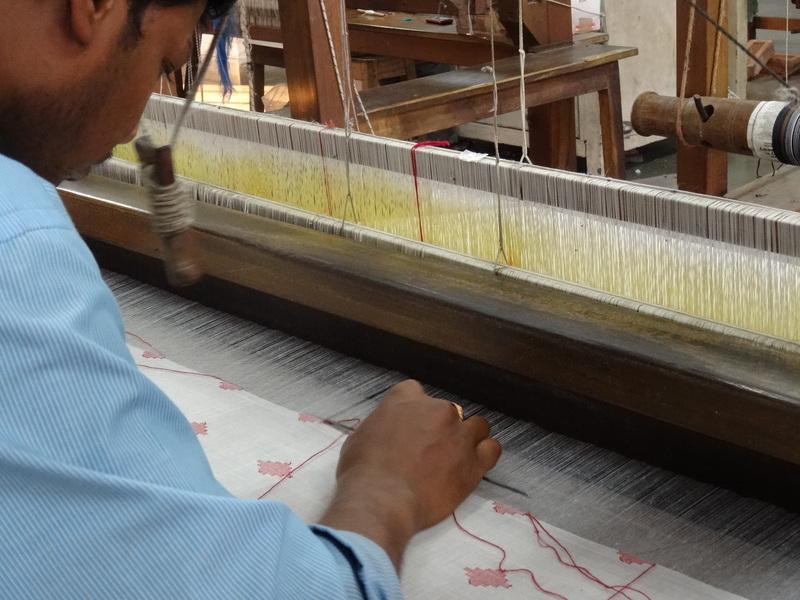 At Varanasi we visited Loom to Luxury, where we saw handloom weavers who were clearly regarded as important team members, their families provided with food, clothing and shelter, and their working conditions clean, airy and well lit. 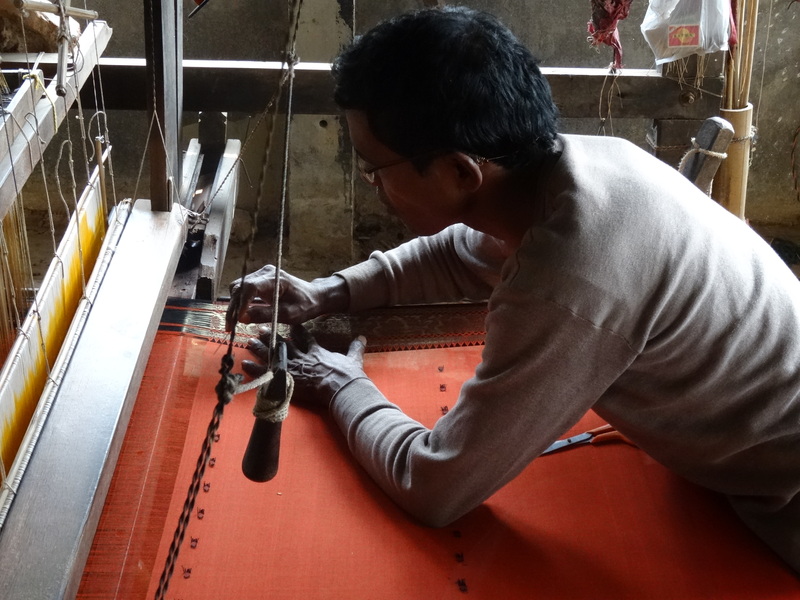 This organization believes that a better standard of living for the weaver and his family is critical to the production of high quality handwoven silk. They are building a huge Community Facility Centre designed specifically for the lifestyle and needs of the weavers and their community as a whole. The weaving process here is fairly typical. 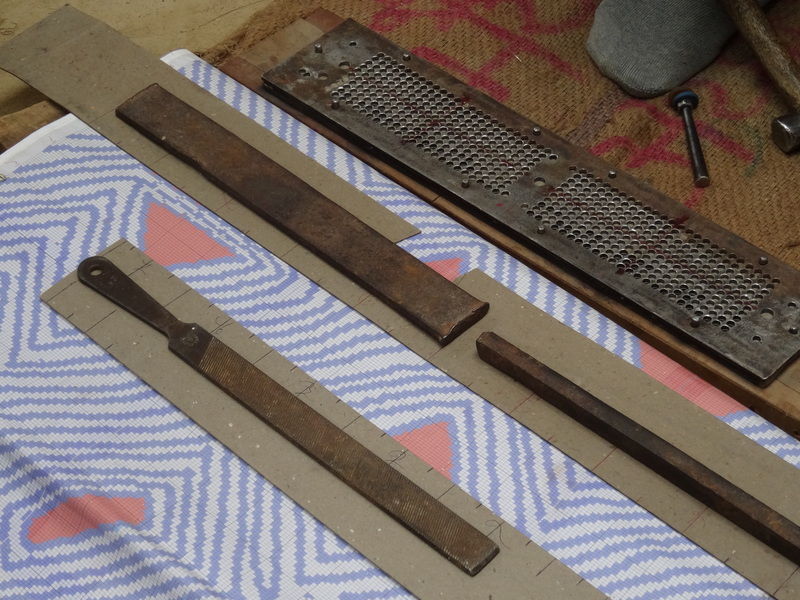 The design is drawn on a full scale graph used to create punch cards which will be sewn together and fed through the loom to control the warp threads that are lifted at different times to make the pattern. Silk yarns are dyed, then strung on the warp in a highly skilled process. 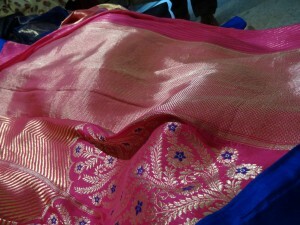 The warp is usually long enough to make several saris, each approximately five metres. 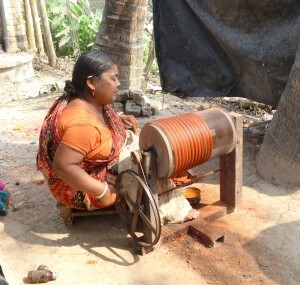 Women have a role in spinning thread onto bobbins for the weft. 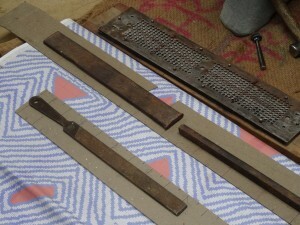 If jacquard is used, there is a supplementary part of the loom that is set up to control this complicated pattern. We also met designers who are committed to protecting the heritage of handloom weaving. In Delhi we visited Raw Mango studio, producers of chanderi style saris and handwoven textiles. 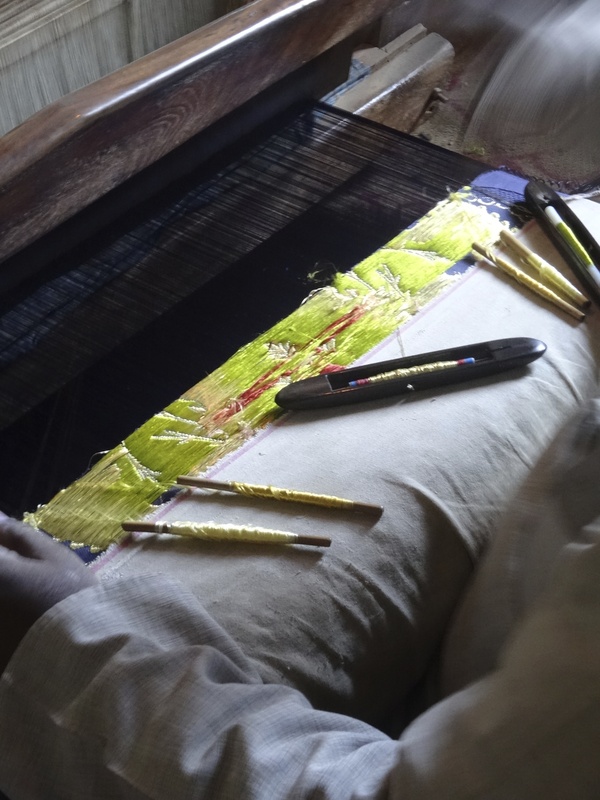 This is owned and run by Sanjay Garg who works with a team of designers and 500 weavers in clusters across the country, making contemporary designs on Benarasi silks, Gujerati mashru (colourful satiny stripes) and Akola block printing. Sanjay, an energetic young man who rose from a very ordinary level of education, is highly respected and has his work represented in the V&A. Also visited young designer Anuradha Ramam, who also blends contemporary design with tradition and works alongside 350 weavers, to ensure they pass on their skills to the next generation. Anuradha has a retail store in Delhi. 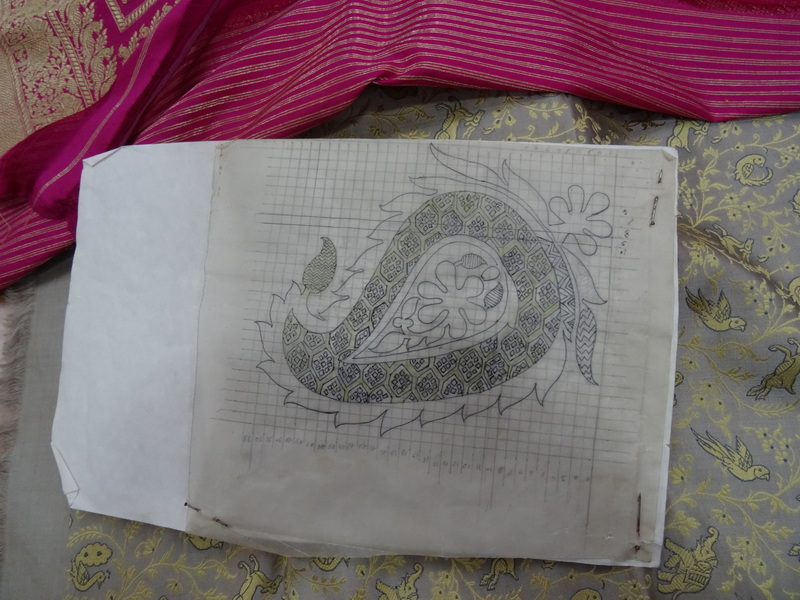 A clear explanation of the complex and varied textile techniques we encountered on our wonderful tour of northern India.